Spring is in the air and so too is Mother Nature's calling to revitalize, rejuvenate and rejoice. After a long and stress-filled winter, I know I feel compelled to escape the everyday, indulge in some rest and relaxation, and celebrate the beauty of the season, which also happens to be replete with many a birthday. 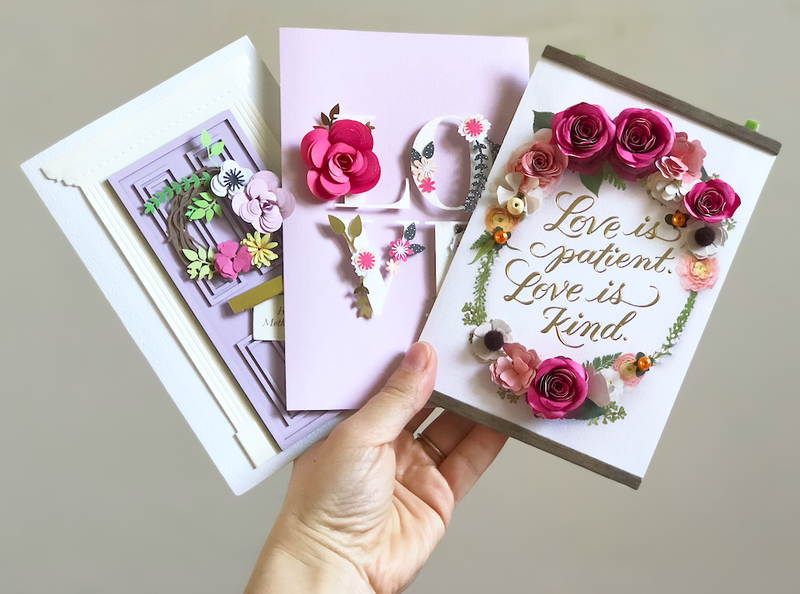 Luckily, I had a little help from Hallmark in finding the perfect gifts for my family and friends. First up is this beautiful Mark & Hall Camel Colorblock Tote Bag, featured above. Stripes are always fashionable and this handbag has the perfect blend of simplistic style and practicality. It's a steal at a special value of $14.95. Featuring comfortable shoulder straps and a reinforced bottom panel in attractive vegan leather, it pairs beautifully with a matching embossed luggage tag and passport holder set. We gifted this as a bon-voyage-slash-early-birthday gift for my sister-in-law who is living in Italy for a few months while she works on writing her cookbook. But it would also make a great gift for a graduate, honeymooning bride and groom, or a friend journeying abroad. We also threw in a botanical inspired Floral Grey Scarf, available at a special price of $9.95. 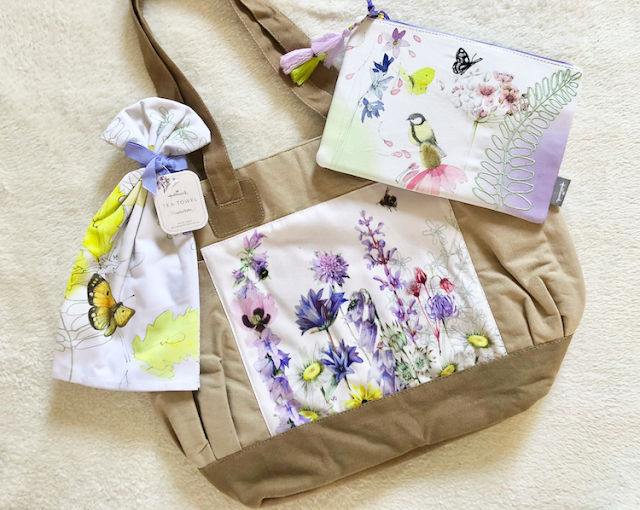 For my mother-in-law's birthday, we gifted her a pretty Marjolein Bastin Garden Bag ($34.94), which she plans to use as a tote. It has two outer pockets and a larger centre storage section that includes a zip pocket. The burlap-style canvas design creates a natural backdrop to the classic Marjolein Bastin garden scene of colourful flowers and bees, and it matches perfectly with the Bird Tea Towel ($9.95) I gave her for Mother's Day. And the Bird, Butterfly and Floral Accessory Bag ($16.95) is just as pretty! End-of-year teacher gift, anyone? For the littles celebrating springtime birthdays or kindergarten graduation, check out these new Happy Go Luckys mini plush toys ($12.95). 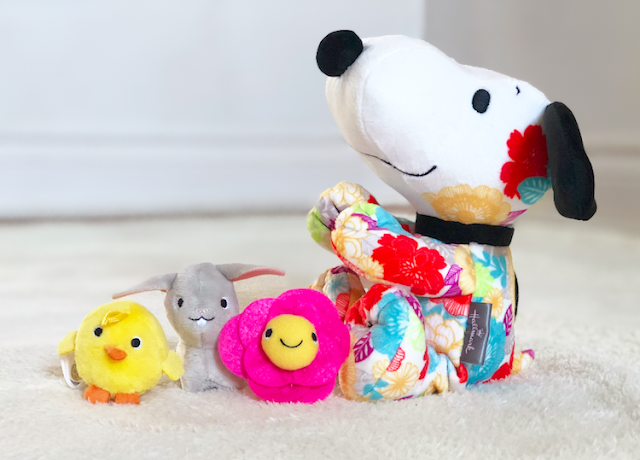 The Springtime collection includes Twirp, the adorable chick, who is as mighty as he is little, his friend, Boe Kay the flower, who loves to brighten everyone's day and the street-smart gray bunny, Hip Hop, who bounces through the day with a style all his own. And of course, I can't forget Floral Print Floppy Snoopy ($12.95). This stuffed animal screams "spring" and is just begging for little hugs! 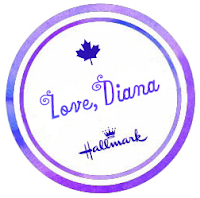 Of course, Hallmark is the perfect place to find the perfect greeting card. You can never go wrong with any of their Signature cards, decked with beautifully crafted embellishments. How do you pick just one? Finally, whether you're going away for the weekend or planning a staycation filled with yoga and meditation, don't forget to spoil yourself. Hallmark's Hot + Cold aromatherapy Lavender Comfort Wrap ($34.95) soothes, relaxes and rejuvenates achy shoulders, sore spots on lower and upper back or the tummy area for relief of uncomfortable cramps. It features a blend of aromatic herbs known and selected for their qualities to calm, soothe, and release stress, including flax seed, lavender, chamomile, peppermint, spearmint, lemon grass, rosemary, cinnamon and other natural ingredients. While you let the wrap do its thing, chill on the sofa in a pair of "Just Chill" lotus flower slippers. These fun and casual slippers are soft and cozy, and retail for $29.95. And remember to rehydrate and remind yourself that glamour has no age limit with a sassy 17-ounce water bottle, featuring a double-wall construction and a screw-top lid. Need somewhere to store them all while on your mini getaway? Check out their classic faux-leather Mark & Hall zippered tote. 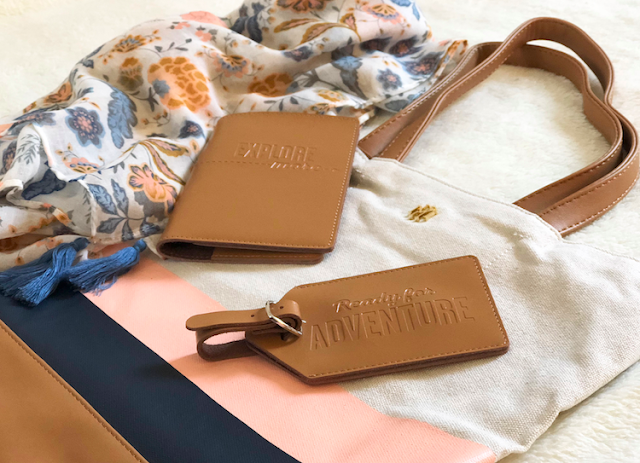 It features two decorative tassels, gold-tone expansion zippers and a bright floral-lined interior that makes it easy to find what you're looking for. It also includes a zippered interior pocket and a detachable zippered wristlet. Want the perfect excuse to just chill? Enter for a chance to win a pair of "Just Chill" slippers, valued at $29.95. This giveaway is open to Canadian residents only, excluding Quebec, who have reached the age of majority. Please complete the Rafflecopter form below to be eligible to win. I think the slippers are my favorite with Floral Print Floppy Snoopy a close second. The Floral Print Floppy Snoopy is my favourite - so cute, and the bright flowers definitely make me think "spring!" I love that Floral Grey Scarf! The Floral Print Floppy Snoopy is my fav!! Thanks! I love the Floppy Snoopy. So cute. I love Floppy Snoopy the most. My favorite from this collection is the "Just Chill" lotus flower slippers. I like that Garden Bag - it is lovely!